(Nanowerk News) A laser synthesizer developed by an A*STAR researcher and his overseas collaborators produces infrared pulses shorter than the wave period, which could enable scientists to probe how electrons move inside atoms and solids (Nature Communications, "High-energy mid-infrared sub-cycle pulse synthesis from a parametric amplifier."). Importantly, these pulses are readily absorbed by many atoms and molecules because their wavelengths lie in the mid-infrared range. Processes within atoms, such as electrons moving from one energy level to another, happen extremely quickly, on time scales of femtoseconds (10-15 second) or even attoseconds (10-18 second). 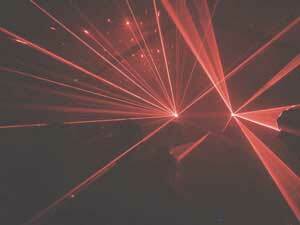 Consequently, researchers need very short, high-power laser pulses to observe these events. One way to generate them is to shine highly intense, ultrashort infrared pulses on to nonlinear crystals. Houkun Liang at A*STAR’s Singapore Institute of Manufacturing Technology and his colleagues in the United States and Germany realized they needed to rethink conventional approaches for generating ultrashort mid-infrared pulses. To simplify things, Liang and his colleagues used an optical parametric amplifier – a device that produces two pulses, which cover different spectral ranges and whose amplitudes and phases can be fixed relative to one another. The team constructed their amplifier to have a very short time delay between the two pulses, meaning they naturally combine into a wide-bandwidth pulse with no need for noise control. The resulting pulse could be made even shorter than the period of the wave because constructive interference occurs at its center, while destructive interference ‘trims’ the pulse at its edges. Perhaps the most useful characteristic of these mid-infrared pulses is that when they are directed on to certain solids, they can stimulate the emission of higher energy photons in the deep-ultraviolet or extreme-ultraviolet regions. These higher energy photons can then be used to study the fastest processes inside atoms, which occur on attosecond scales. Liang’s team demonstrated this with their system by using the mid-infrared pulses to generate high-energy photons in thin silicon films. “We are interested in using the pulse synthesizer to generate isolated attosecond electron pulses from different materials,” says Liang. These would allow observations of even faster processes within materials.